Adobe Acrobat 8: One upgrade you won't want to skip!! Acrobat will release yet another version this year bring the number of major releases to 8. Many people, including myself, start to wonder “what can be done in version 8 to warrant another major release?” with great skepticism. After all, don’t most people just use acrobat for making PDF’s? Well hold on to your seats! This release is major. Acrobat 8 is by far the largest single functional gain I have ever seen in any product release from one version to the next. For starters – take a look at the welcome screen. The first two, “Create PDF” and “Combine Files” are not that compelling and have been done before, but the other six are very noteworthy. First – being able to “start a meeting” is something that seems foreign to Acrobat, but makes as much sense here as it does in Mac OS/X and Win 32. Think about it. You write documents to capture thoughts and share them with others. Why not have a live meeting (aka video phones of the future) to go over the ideas? When you click “Start meeting”, the menus give you options to connect to another group of people. You can screen share documents and presentations, set up a virtual meeting URL to communicate anytime, anywhere, set up a conference on the fly and much more with no software downloads for other participants. 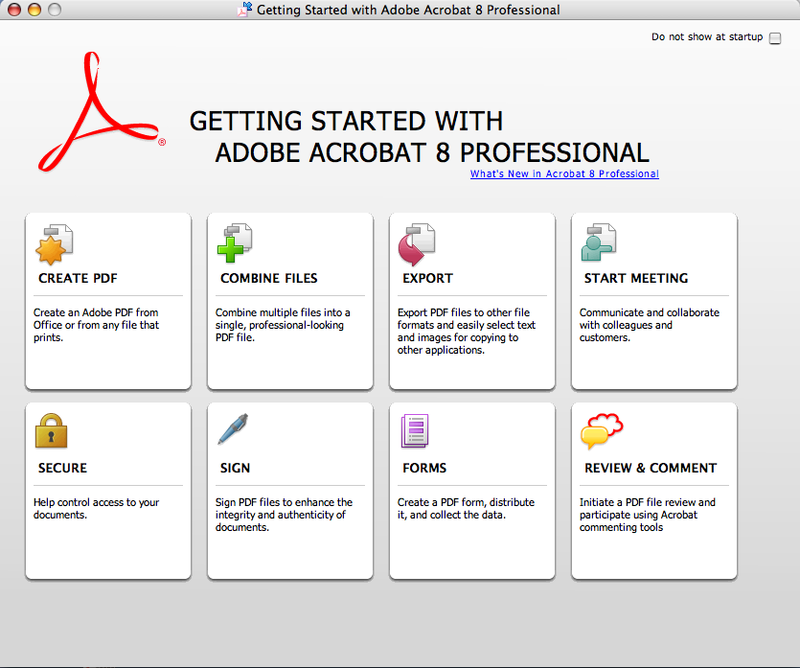 The meeting is given via a complimentary 90 day trial to Acrobat Connect (formerly the software known as Macromedia Breeze). 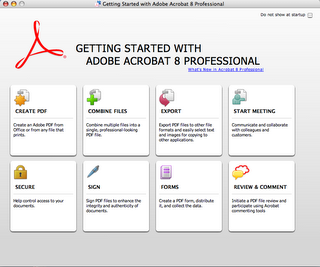 Note – be sure to register your trial of purchased copy of Acrobat 8. You will get an email that provides free services as part of the package. Another immensely cool thing is how Acrobat 8 integrates with Adobe LiveCycle Policy Server. 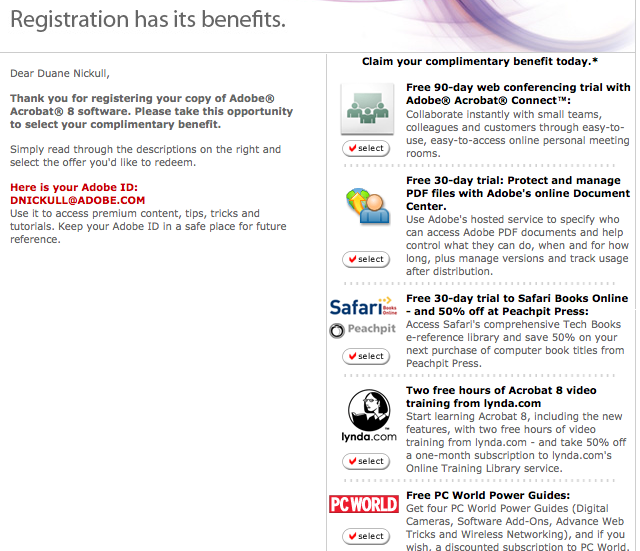 Adobe has fully embraced the Software as a Service (SaaS) model (very web 2.0-ish). The hosted policy server allows you to place default policies on all documents you create. This gives you great control over the documents. You can revoke a document after distribution (Policy Server works with a new model of “persistent policy protection”). You can also audit and track who has read your document. No more “suspecting” your colleagues haven’t read your important documents – now you can tell for sure. Another really cool feature is the ability to make any document into an electronic PDF form. This is far easier than in previous versions of Acrobat. There are automated wizards to help you make a form based on an existing form, existing document or from scratch. Long and short – this is a killer upgrade. If you skipped 6 or 7, you will want to go right to Acrobat 8 Pro. It established Adobe as a serious player in the whole “web 2.0” movement (note that we still don’t know what “web 2.0” really means, but think it is cool).